The public is invited to view Commence: Sculpture Projects 2015, an outdoor exhibition of 11 new public art projects created by talented students in professor Jann Nunn's advanced sculpture class at Sonoma State University. The outdoor sculptures are on display throughout the Rohnert Park campus from May 6 through Commencement Day on Saturday, May 16. The project is a part of Nunn's public art curriculum, showcasing the work of students pursuing BA and BFA degrees in art studio at Sonoma State. Themes range from political, like states funding prison over education, to social, like online dating. The wide variety of sculptural approaches, materials and techniques used include figurative cast bronze, welded and fabricated steel, process and community-engaged interactions. 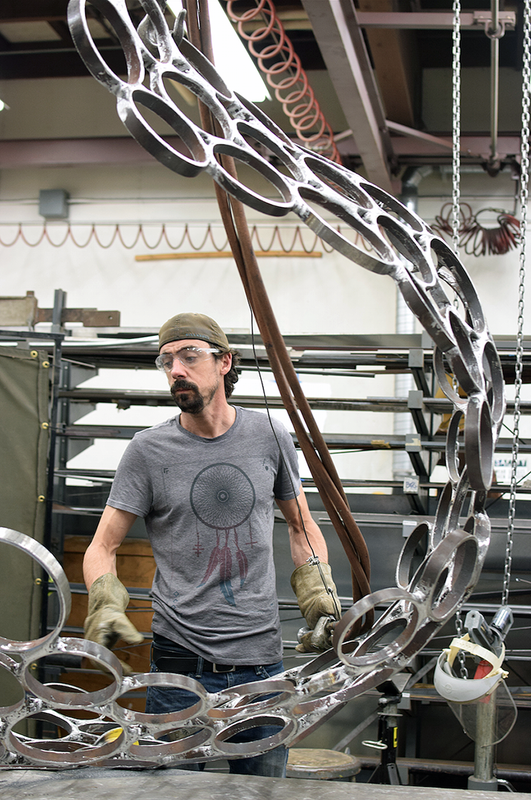 These large-scale, outdoor artworks enhance the already beautiful campus grounds and increase awareness of the strong visual arts program at Sonoma State. Most importantly, they provide an educational experience for these budding professional artists that will fortify their post-college careers. "This pragmatic, hands-on training within the campus environment allows students the opportunity to engage with campus visitors in a public art context," says Nunn. The Sculpture Department will host a reception for the artists on May 13, 4-6 p.m. in the art building sculpture courtyard, followed by a tour of the sculpture projects led by Nunn and the participating artists. The public is invited to attend. Student artists include James Blake, Martin Gilbertson, Briona Rachelle, Eduardo Hernandez, Jessica Levey, Victoria Helena Mihatovic, Jessica Noyes, Dino Sbardellati, Andrew Scanlon, Sean Patrick Shadduck and Michael Walton. Maps will be available in the University Art Gallery and at the University Library circulation desk. Print Cart is a fully self-sufficient wood block printing station that allows viewers to participate in the production of an artwork they get to keep. Learn about the woodcut process, one of the world's oldest printing technologies, and make a print of your own while you graduate! This abstract sculpture utilizes the landscape and materials of steel and redwood to evoke the adventurous spirit and growth found in the pursuit of higher education and the continued exploration beyond the walls of the university. Thumbs Up, Seven Up is an iconic game that many children play. Sadly, as we mature, we too often hide our childlike wonder from the world. This figure encourages us to access this innate aspect of ourselves. Choose your "Inner Child!" Somebody is a symbolic representation of someone just on the edge of the viewer's perspective. This gender and race neutral sculptural figure allows the viewers to interpret the artwork on their own terms. Tunnel of Love addresses the singularity of meeting romantic prospects and the misleading and often humorous way we exemplify ourselves in pursuit of online love. This experiential tangible object is meant to echo a virtual reality. The State of California spends $70,000 per year to keep an inmate in a SuperMax prison and $6500 per year to keep a student in the California State University system. The Prison Industrial Complex has become a monolith robbing our society of rehabilitation and education. Pyramidal Biomes underscores the negative effects that economic and industrial growth has on our environment. The sculpture exemplifies the entrapment and isolation of natural organisms and the need for sustainability and preservation. Earth, rendered an empty shell, is abandoned as humans search for other worlds. Will these planets suffer a similar fate? Displaying at once a sense of fragmentation and individuality, but also, inextricably interconnected, this work reflects the artist's experience at Sonoma State as a place to advance and grow individually, an intrinsic part of a larger community moving in a positive and exciting direction. This bench is a reflection of the City of Hashimoto's flag. Hashimoto, Japan is Rohnert Park's sister city, a relationship that strengthens cultural understanding and tolerance. Please take a moment to sit and reflect on your own international relationships. "Dai 3 no keiro gēto~ei"
Converging paths are opportunities to a brighter tomorrow, while never forgetting those who have journeyed before and alongside us. Three sculptures have been installed in Sonoma State University's Student Center to inspire students and create a sense of space in the university's newest building. Sonoma State University faculty emerita Barbara McCaffrey was invited by the Ambassador of the Republic of Rwanda to speak at the Commemoration of the 22nd Anniversary of the 1994 Genocide Against the Tutsi hosted by the Rwandan Embassy in Washington, D.C. on April 7.